Both impressive and hilarious this stunt, however, can’t overshadow Jeremy Piven‘s acting talent. Have you seen Entourage? It’s brilliant especially because of his role and acting there. The show is about a young movie star and his friends and agent Ari Gold (Jeremy Piven) who is vigorously eloquent and hard working. The behind-the-scenes of glamorous live of a Hollywood star and his entourage. The last season is set to air this year on HBO with Mark Wahlberg as executive producer. Aren’t you enticed yet? Well, Piven has been busy promoting the show and has stopped by the Late Show With David Letterman. There he showed off his 80’s dance moves, which were the splits. I had perfected the Worm and I broke it out and I did a nice job. There were a lot of admirers and I think I peaked as a man. answered Piven when Letterman asked if he dances. After a little warm up Jeremy Piven stretched on the floor before the cheering audience. 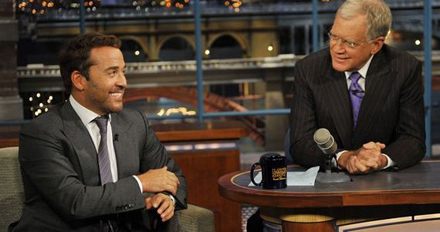 Watch Jeremy Piven doing splits on Late Show With David Letterman.